Nikolai Yakovlevich Marr (Ð�Ð¸ÐºÐ¾Ð»Ð°Ì�Ð¹ Ð¯Ì�ÐºÐ¾Ð²Ð»ÐµÐ²Ð¸Ñ‡ ÐœÐ°Ñ€Ñ€) was born in the Georgian town of Kutaisi on the 6th of January 1865 (the 25th December 1864 according to the Julian calendar then in use in the Russian Empire). His father was Scottish (an agricultural engineer who was working in Georgia) and his mother was Georgian. His father died when he was aged only eight. 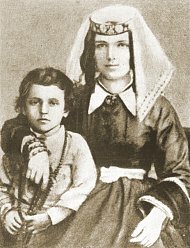 The photograph on the right, taken in 1870, shows Nikolai Marr with his mother. 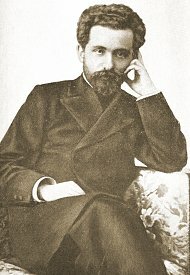 He gained a diploma in 1884 from the high school of Koutaisi before entering, at the age of 20, the Department of Oriental Languages at the University of Saint Petersburg where he specialised in the Armenian, Georgian, and Iranian languages. In 1891 he joined the staff of the University. In 1880, the Imperial Academy of Science in Saint Petersburg decided to develop a program of archaeological excavations modelled on the work of English and French archaeologists in the Near East and in Iran. They felt that this would be an important way for the Russian Empire to demonstrate its new status as a World Power. The publication in 1889, in Paris, of the book "Scientific Mission to the Caucasus" by the French archaeologist and explorer Jacques de Morgan prompted the Saint Petersburg Academy to take a closer interest in the antiquities of Armenia. It was for this reason that Nikolai Marr was sent with a small team to undertake the first proper excavations at Ani during the summer of 1892. The first archaeological campaign at Ani lasted only a month. Excavations were concentrated in the vicinity of the church of the Holy Redeemer (site #51), and the foundations of a chapel (site #51a) were exposed near the eastern part of the structure. These site numbers are the identification numbers the excavators assigned to various monuments at Ani - see Nikolai Marr's plan of Ani for a full listing. Further excavations within the north-western sector of the walled city unearthed the ruins of the church of the Bakhtagheki family (site #24), dating from the 12th or the 13th century. 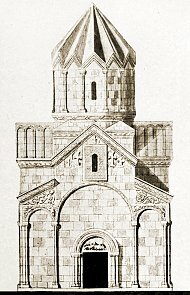 So many fragments of masonry were found that it was possible for the architect Toros T'oramanian to produce this drawing showing a reconstruction of the west facade of the church. Several large masonry fragments bearing frescoes were also discovered, and taken back to St. Petersburg. As a result of these encouraging beginnings, the team undertook a second expedition to Ani during the summer of 1893. First they uncovered the wall that once protected the old city, known as the "wall of Ashot" and constructed in 964; then the remains of the church of Horom Tikin (site #60), north of the wall of Ashot; then the ruins of the church of the Mother-of-God of the Khamboushents family (site #102), built between Ashot's wall and the citadel. Parts of the residential quarter within the same sector were also revealed. After this first session of excavations at Ani, archaeological work stopped. The exact reasons for this are not known, but were perhaps due to the political context of the times. The Russian authorities in the Caucasus certainly saw the Ani excavations as a suspect enterprise, and considered that any project intended to reveal the past glory of Armenian civilisation could contribute to the eventual undermining of Russian rule in Armenia. They were justified in having these fears: because of its size, wealth, and status as the Bagratid capital, Ani had quickly come to symbolise the whole Armenian state, and then - after Ani's decline and the fall of that Armenian state - it had become a symbol of the concept of an Armenian state. 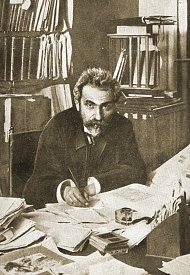 Meanwhile, at the University of St. Petersburg, Marr became a lecturer in Armenian and Georgian philology, then was awarded a doctorate in philology, and finally was appointed Professor of Armenian and Georgian Literature. This photograph of Marr is from 1905. 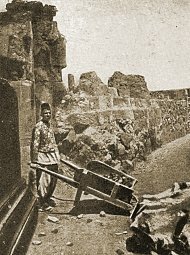 During the intervening years, some Armenians, including the photographer Aram Vruyr and the architect Toros T'oramanian (pictured opposite), had continued to study privately the ruins of Ani. Both these individuals later joined Marr's team. 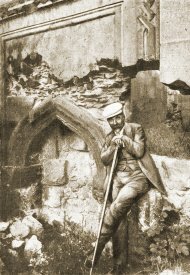 Team members varied over the years, but other Armenian participants included the archaeologists Ashkharbek Kalantar and Hovsep Orbeli, the painter Arshak Fetvadjian, the historian Nikolai Adontz, and Artashes Vruyr (the son of Aram, and also a photographer). Armenian funds also partially financed the work. It was not until the summer of 1904 that excavations resumed at Ani. That year, preliminary work was done on the site, concentrating on the urban zone around the main roadway through the city that descended from the citadel and led to the "Lion Gate" in the outer walls. A stone relief model of a church was also discovered, initially thought to represent the cathedral. Large scale excavation started in 1905. Marr was especially interested in locating the site of King Gagik's church of Saint Gregory, known as the Gagikashen (site #15). This church was built as a copy of the famous church of Zvart'nots near Etchmiadzin, the foundations of which had been discovered in the year 1900 and then excavated. Gagik's church seems to have captured the imagination of medieval Armenian historians - the words of Step'hanos Ashoghik, Kirakos Gandzaketsi, Mkhit'ar Ayrivanetsi and Samuel Anetsi provide a detailed description of the structure and also gave a rough indication of its location, overlooking the Tsaghkotsadzor valley. The attention of the archaeologists was drawn to a large mound, whose summit was covered by a graveyard and contained the remains of foundations that seemed to be the vestiges of a wall (but which excavation revealed was actually the remains of one of the pillars of the church). After excavating at the edges of the mound, they began to dig at its summit and, in Marr's words, "hardly had the Armenian labourers time to deepen excavations into the second layer of the hill when we discovered the voluted capital of one of the pillars". Marr identified three major layers within the mound, forming a total height of about 8,75 meters. The highest layer contained a cemetery from the 16th century; the middle layer contained a mixture of graves (of better quality that the highest layer) and the ruins of modest dwelling houses; the lowest layer contained the remains of the church. An account of the excavation of this church is contained in Marr's 1934 book "Ani, a history of the city and its excavations". You can read a translation into English of the chapter dealing with the 1905 excavations. Excavations also resulted in the discovery of the statue of the builder of the church, king Gagik I, holding a model of his church. The area around the church was also excavated, revealing, amongst other things, the foundations of a palace (site #17). This had an entrance facade similar to the Baron's palace, and comprised "a design in stone marquetry comprising sculpted red stars and black rhomboids, a decoration of remarkable richness". The excavators named it the "palace of Sargis" after a name engraved on one of the six-pointed stars on the facade. It is not known if this Sargis was the architect of the structure or its owner - Marr thought he might have been one of the archbishops of Ani, such as Sargis the 1st (1209-1211) or Sargis the 2nd (1245-1276). Excavations of Gagik's church and its vicinity continued during the 1906 season. 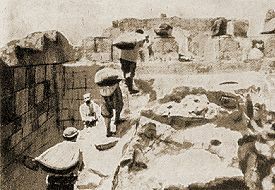 The sixth and seventh season of excavations, in 1907 and 1908, concentrated on investigating the citadel and its royal palace. On the slopes of the citadel was found the remains of six churches, each with a different design. The most interesting was the palace church (site #109a) located within the southern half of the palace complex and, according to Marr, "the only known church going back to the period where the Armenian royalty was not yet established in the district of Shirak". Of the citadel palace before the excavations began, only a fragment of wall was visible: the archaeologists found this to be the only surviving element "of ceremonial rooms within the upper floor of the royal palace". Excavations uncovered the lower floor level, revealing a plan composed of a large number of rooms, cellars, and pits. The palace had been frequently altered, and seen many reconstructions, before being destroyed and then gradually looted for its materials. Charred beams and other remains found during the excavations indicated that the palace had suffered a terrible fire that had entirely ravaged it. Under paving was found a double set of water conduits (one with clay pipes, the other with iron pipes) that had supplied water to rooms of the palace from a large cistern located under a hall. Marr later discovered clay pipes that passed under Ashot's wall and had brought water to the citadel from a spring situated nearly eleven kilometres from the city. A bath-house with seven rooms was discovered in the northern part of the palace. The actual bath had two compartments with a hypocaust floor, separated by a narrow room containing a water reservoir and a cauldron intended to heat the water. Excavations during the years 1907 and 1908 gradually revealed most of the plan of the royal palace, which was divided in two parts, a north and a south, by a narrow corridor about 59 meters long. During the excavations of 1908 the number of workers employed for digging and clearing exceeded a hundred. Some of them are shown in the photograph opposite. Thanks to their labours, Marr was able to excavate the vaulted underground halls of the palace, in which were found many architectural fragments from a destroyed basilica hall that had been on the upper floor level. Marr later wrote: "...the artefacts collected were sufficient to confirm that the zeal of the builders had been concentrated on decorating this hall in an exceptional manner. The tales in old Armenian accounts of the gold covered rooms in the royal palace of Ani had seemed to us to be only legendary exaggerations. Remains found in the underground level of the basilica hall allow us to establish that it was not a legend, but the literal truth". It was discovered that this hall had three naves: two rows of wooden columns rested on stone pedestals and carried arches with a carved wooded arcade. The ceiling was adorned with wooden carvings, including large rosettes. The walls had frescoes on plaster representing flower gardens and groups of horsemen, and there were more frescoes, depicting figures of kings and queens, in a frieze above the arches. The 1907-1908 excavations also uncovered a large caravanseri (site #39) situated to the north-east of the church of the Holy Apostles and dating probably from the 10th century. The north and south portals of this building were particularly ornate, and many fragments of stone decoration from it were found. In the photograph opposite, from 1907, the twisted "barleysugar" mouldings are part of the doorway of the caravanseri. The woman behind Marr is his wife. In 1908 Marr had commissioned the young, St. Petersburg-based, architect Alexander Tamanian to design a new building to house the Ani museum. Although a preliminary design was produced, the project was never realised. 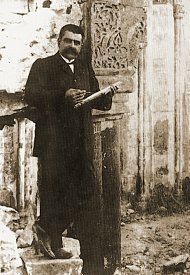 The commission was important for Tamanian because it was his first contact with traditional Armenian architecture. 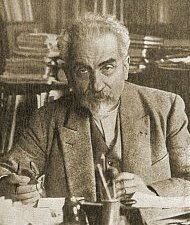 In the 1920s and 1930s it was Tamanian who was primarily responsible for designing the masterplan for the city of Yerevan. The eighth expedition, in 1909, uncovered the "fire temple" (site #37), a four columned structure that was later transformed into church. However, it was excavations in and around the church of the Apostles (site #38) that occupied most of the excavators' time. The photograph below shows Marr and his wife arriving at Ani by bullock cart. The expedition of 1909 also revealed the main street leading from the door of the citadel (site #118) to the mosque (site #95). The archaeologists were able to get an idea of the arrangement of houses along this major axis. The bases of buildings at the corners of crossroads were protected by large basalt slabs so that wagons would not damage their foundations. Stone benches were placed on the street in front of some houses. Because the houses were always situated at a lower level than the street a sort of basin of cut stone was set in front of most entrance doorways to protect the house from rainwater. Thanks to a system of corridors, a single door onto the street often served as the entrance to several houses. At street level, some houses had stone staircases built into their external walls that would have led directly to their roofs. The clearing of the roadway that connected the citadel to the main city gate took up most of the team's effort during the 1910 season. To best use his labour force, Marr divided this street into five sections. Excavation revealed that under the street paving was buried water pipe conduits serving the city, plus a passage, 0.56 metres wide and 0.27 metres high, through which it was possible to crawl. This passage was probably a tunnel to allow for maintenance of the clay water pipes. 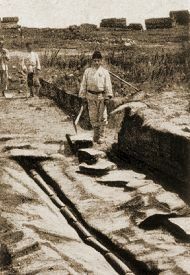 The photograph shows a section of roadway with some of the clay pipes uncovered. In addition, during the 1910 season the Kars Gate was completely cleared of debris and fallen masonry. For the first time a plan of all the walls was drawn up, and a general plan of the city was outlined. Also in 1910, Marr investigated two other structures: the church known as the Georgian church (site #26) and the church of St. Gregory (site #82), constructed in 1215 by the merchant Tigran Honentz. During the 1911 season the section of the main street up to the minaret of the mosque of Abu'l Muamran (site #62), was completely cleared. Excavations along the main roadway revealed two series of shops. The remains of the mosque were investigated. Based on the proportions of the collapsed minaret, Marr had expected to find an impressive building. However, it was discovered that the mosque hall had been a modest structure, that most of it had been later demolished and crudely built houses constructed on its foundations, and that the mosque had also been built on earlier foundations. The foundations of an octagonal Muslim tomb were also discovered. The "underground city" of Ani was also explored in a methodical manner for the first time. It was discovered that these troglodyte habitations constituted a separate district of the city. They were sometimes dug on three levels, and contained churches, crypts, shops, and houses. Although already partly collapsed by the time of the excavations, architectural details such as columns, vaults, domes, and traces of frescoes were found - showing that this district sometimes contained the houses of well-off people. The end of the tenth campaign of excavations was devoted to investigating the palace known as the "Baron's palace" (site #9). In 1912 Marr became a member of the Imperial Academy of Science. The eleventh archaeological expedition to Ani started on the 1st June 1912. For the first time, substantial funds were assigned to pay for the strengthening or partial consolidating of those monuments that were most at risk of collapsing. Repairs were undertaken on the following churches: the round church of Saint Gregory (site #15), the Georgian church (site #26), the church of the Holy Redeemer (site #51), and the church of the Holy Apostles (site #38). The above photograph shows the church of the Holy Apostles after its consolidation. Work was also undertaken to improve the two museums that Marr had established at Ani: the "Department of Art Objects" was housed within the Minuchihr mosque and the "Department of Architecture and Epigraphy" was housed in a new building located 200 metres to the south-west of the mosque. Actual excavations were concentrated on two sites located between the citadel and the wall of Ashot (sites #100 and #101). The first site was revealed to be a church initially built without a dome, but with an inscription mentioning a reconstruction in 1042 that transformed it and gave it a dome. The second site (#101), situated to the east of the main street, was found to be the ruins of a church that had a "simple domed basilica" design. Its west wall was unique in that it had no doorway in it, was solid, and had, on the inside, three semicircular niches. Marr speculated that this church was also originally built without a dome, and when one was added the unusual design of the western wall intended to be a support for it. Some of the streets and houses around these churches were also uncovered. Other excavations discovered the remains of potteries and workshops, confirming the existence of a local production of ceramics. Architectural surveys were also undertaken, including ones on the Kars Gate and the walls of Ani. During the summer of 1913 the twelfth expedition concentrated on the area surrounding the church of the Redeemer (site #51). Marr was seeking to locate the palace of the Armenian prince Ablgharib, whose name is mentioned in a construction inscription on this church. Excavations were undertaken to the north-west and to the south-west of the church of the Redeemer, then on the highest section of a tumulus (site #44), then on the quarter situated to the south of the Georgian church. But the palace remained undiscovered, and the excavators came to believe that its remains had simply been recycled into other buildings. Marr then decided to re-group his workers around the church of the Redeemer, where they discovered to the north-west, a mausoleum, a rectangular hall, and a house (sites #52, #52a, #52b); to the south, two oil presses (sites #76 and #76a) plus a sector of the street leading from the Gayladzor valley into the city; to the north-west, a chapel (site #50) and houses; to the west, the church of St. Sarkis (site #72), built in 1152. Next to the church of the Redeemer were found the remains of the bell tower, a small chapel, a local distribution network for water, and (possibly) a part of the structure of Ablgharib's palace. Marr's account of his excavations contained in his 1934 book "Ani, a History of the city according to literary sources and the excavations of the site of the ancient city" ends with a description of the 1913 season. Excavations actually continued until 1917, but nothing was published and the excavation records were lost at the end of the war. However, partly due to the memoirs of Artashes Vruyr (the son of Aram Vruyr), a little is known of the work done during this period. In 1915 a systematic survey was started of the main structures of Ani, and the troglodyte part of Ani was entirely explored. In 1916 Marr took advantage of the fact that Russian troops had taken control of the lake Van region. He travelled to Van with several members of his Ani team (A. Kalantar, H. Orbeli, and Aram Vruyr) in order to study and excavate the Urartian remains that existed there. A book describing their findings was later published. Other team members continued the work at Ani, which that year consisted mainly in undertaking a survey of the churches previously excavated and to methodically photograph them. This photograph of Marr is from 1916. 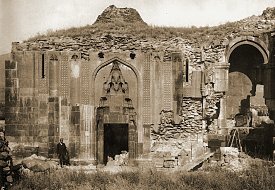 In 1917, Marr started some minor excavations at Ani, such as revealing the foundations of a Muslim mausoleum located near the Cathedral. The excavation of the various buildings that lay opposite the east facade of the cathedral was also probably undertaken in 1917. The work to survey and photograph all the remains continued. Marr had hoped, it seems, to begin a restoration of the cathedral, starting the following year. The Russian archaeological mission continued to work on the site of Ani until the revolution of October 1917. 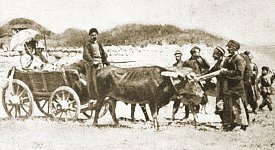 By 1918, Ani was under the threat of the Turkish troops that were advancing towards Alexandropol. One of the Ani archaeologists, Ashkharbek Kalantar, gathered a group of young people from Lori, and then took a truck to the Ani railway station - located about six or seven kilometres from the medieval city - to attempt to carry the contents of the Ani museums to safety. 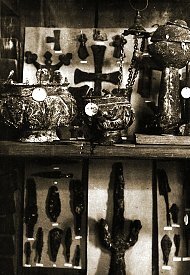 The photograph on the left shows some of the contents of the "Department of Art Objects" museum that was housed within the Minuchihr mosque. The photograph below shows some of the stone artefacts within the "Architecture and Epigraphy" museum. Unfortunately Kalantar only had time to rescue part of their contents because Turkish forces were already close to Ani. They left behind most of the stone objects - including the famous statue of king Gagik - as well as most of the excavation's archives, survey notes, photographs, etc. From Ani the rescued artefacts were taken to the monastery of Sanahin. They were later taken to Yerevan and can now be seen in the State History Museum of Armenia. 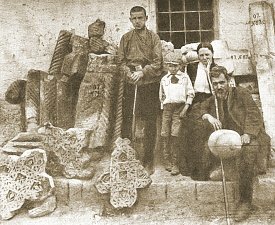 According to Artashes Vruyr, Kalantar managed to make a final visit to Ani in 1922 and found that the main museum and the stonework museum had been looted and destroyed, their doors and windows wrenched off and their roofs removed. Marr had already painted a similar picture in his essay published in 1921 in "Revue Des Ã‰tudes ArmÃ©niennes", pointing out the irony that the people who had destroyed the museums were probably the same Muslim villagers that he had employed as workers during the excavations. 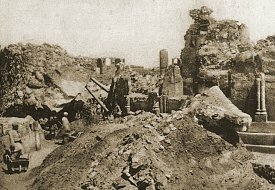 The destruction of the Ani museums was also reported in the French newspaper Journal des Debats of 22 April 1922, which cited it as a reason to believe emerging reports that Kemalist Turkey had started destroying historical Armenian monuments and was erasing Armenian inscriptions from buildings as part of a campaign to eliminate "all traces of everything that was not Turkish" ("ils pretendent y effacer la trace de tout ce qui n'est pas turc"). Until the 1990s it was spossible to see many small fragments of glass on the floor of the Minuchihr mosque - probably the remains of smashed photographic plates. Fragments of carved stonework still lie on the slopes below the mosque - presumably thrown from its windows by the looters. Marr's second museum (the one for stone carvings) today survives only as fragmentary foundations. Until the early 1990s the ground within those foundations was covered with a very large quantity of stone carvings - at least 50 pieces - the remains of some of the museum's contents. 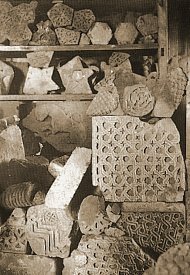 They have almost all since been removed (probably stolen), except for a few of the largest pieces (including a fragment from the Apostles church that is depicted in photograph 151 in Marr's "Ani" book). A fragment of the lost statue of king Gagik has recently found its way into the Erzurum archaeological museum. The circumstances of its re-emergence are uncertain; it was there at least as early as 1993 but was not recognised for what it was until rather later. Nikolai Marr's early academic career was devoted to the study of languages rather than archaeology or art history - and it was to his former discipline that he returned to for the remainder of his life. During the 19th century the science of linguistics developed the "comparative method" - a set of principles whereby languages could be systematically compared with respect to their sound systems, grammatical structure and vocabulary. This showed that families of languages were related in that they had evolved from a common ancestral language. Some of these families were named after figures drawn from Jewish mythology - for example, Semitic, Hamitic, and Japhetic, after the sons of Noah (Ham, Shem and Japheth). Georgian was defined as a Japhetic language, but Marr's early academic work attempted to prove a connection between the Semitic family of languages and Georgian. Marr's Japhetic-based theories were gradually broadened to include alleged connections to other Caucasian languages, then to other European languages, then to extinct languages like Urartian. In 1921, with the approval of the Academy of Sciences he founded the St. Petersburg (later Leningrad) "Japhetic Institute". In 1923 he was elected President of the Central Council of the Intellectual Workers Department, and in 1930 he was elected Vice-President of the Soviet Academy of Science. By the mid 1920s Marr had developed his linguistic theories to the extent that he could assert that the entire Mediterranean area was inhabited by Japhetic speakers before the arrival of Indo-Europeans, that this "Japhetic" language was actually related to all the world's languages - and that the study of it could lead to an understanding of the origin and development of human speech. Marr called this discipline "New Linguistics", and in 1931 the name of the Japhetic Institute was changed to the 'Institute of Language and Thought". "New Linguistics" rejected the belief that language initially arose out of human need to communicate with one another. Marr believed that a language of gestures (which he called "kinetic speech") preceded the development of vocal speech, and gave way to vocal speech very late in mankind's development. He considered that a specific language belonged to the superstructure of a society (along with cultural things like the political, legal, religious, artistic, and philosophical beliefs of that society), and that the notion of uniting and defining a People by its common language was a creation of "bourgeois nationalism". He believed that language developed not only by evolution, but also by revolution, i.e. by skips and mutations which resulted in the transition of a language from one qualitative state into another without an evolutionary development path. 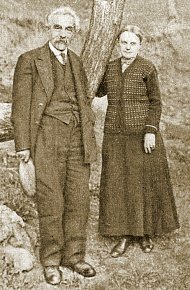 The photograph on the right shows Marr and his wife in 1932. In January 1934 Marr was awarded the Order of Lenin, and later that year organised a scientific expedition to Cyprus and the southern coast of Greece. He died in Leningrad on the 20th December 1934, aged 69, a few months after the publication of his book on the history and excavations of the city of Ani. During the 1920s and 1930s, for ideological rather than scientific reasons, Marr's linguistic theories were promoted and supported by the Soviet Communist Party - who also made life difficult for academic opponents of his theories. However, in 1950 "New Linguistics" and the institutions and academics that supported it were publicly criticised by Stalin. The "Institute of Language and Thought" was closed down. After the death of Stalin in 1953 there was a partial and short-term rehabilitation of Marr's theories within the Soviet Union. They were never widely accepted or even acknowledged in the West, again mostly for ideological rather than scientific reasons (because of their perceived Marxist-Leninist political aspects), and they are now seen as deeply flawed by most modern linguists. This page [Nikolai Marr] was first published in 2002 and was last modified on the 8th June 2006.